So far, we've seen plenty of the iPhone 6s display assembly, revealing a difference in layout and cabling that might be confirming a Force Touch screen pressure sensor of sorts, at least tangentially. It's the first time an alleged iPhone 6s Plus display assembly has leaked out now, though, and it has the same cabling and layout rearrangements when compared to the iPhone 6 Plus, which hint that a similar screen technology will be present on the larger phablet as well, not that we had any doubts. 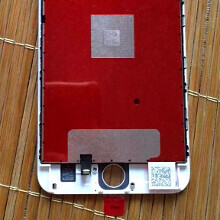 With a pretty red interior, this claimed iPhone 6s Plus display assembly has identical exterior to the one we already have on the 6 Plus, implying that we won't see any major design changes with the new iPhones that will be unveiled next week. That's not hard to believe, as Apple usually makes a thorough design overhaul every third edition of its iPhone line, so the iPhone 6s and 6s Plus will be differentiating with other factors, like said Force Touch display, a 12 MP camera, and faster silicon inside. Force touch is a nice technology... i believe it will be standard technology in smartphones in the coming years..
As couple of Chinese manufacturers have already implemented force touch in their smartphones. It's going to be implemented because it's just something cheap and another check box to tick. It is going to be about as useful as long press which is something developers avoid on purpose and for a good reason too. Just think about it. Force touch in phones is totally useless. What function it will have? Now you got short and long touch,and force touch will do practically same. It will be a chaos if you set long touch with force-camera and long touch without force-settings. You got to always think how long and how strong you will touch it. How do you know it'll have no use? Why would money be spent on it, if there's no use for it? You're simply running off at the mouth dude. Used it, realized it was pretty useless. It's best showing was forwarding and rewinding in movies.... Wth is the seek bar for then? Even on the apple watch it's use is the worst case scenario which is a hidden menu or function. But on the watch it makes some sense due to a lack of easy input options and only one force touch option. On a larger screen there could be any number of force touchable objects just like long touch. No one going to know what is force touchable and if they, they won't intuitively know what it does. It's the worst idea in the world. Apple in the past, it's prime design, days was known for simple yet powerful. Now they're going for complicated and dysfunctional. He may have invented a Time Machine to use a 2015 product in 2014. May have it. Thought both models were already acknowledged of having it. Oh well. My money is ready. Release this Beast. Let's do this. it will surely have force torch; worthy upgrade from 6, that's what we have to wait and see. Force touch is a blatant gimmick and Apple enthusiastic fans just take that as a compliment. When it comes to specs, Apple has always stick to its traditional rule: putting outdated/mediocre hardware and marketing it as something special like iSight camera, FaceTime, .... and wait what? Apple call it revolutionary, and iFans continue to get brainwashed and sell their kidney just for that damn phone. Its such a gimmick that other manufacturers have implemented the same tech in their phones before Apple? You need to take into account what the actual f**k they do with outdated hardware. Yes it is, for the most part, not so revolutionary hardware. However with that kind of hardware they still compete and outperform a lot of others in the smartphone battle, against 4gb ram they still win. Instead of blindly bashing whatever you call "iFans", you should get yourself educated as to why hardware beasts are not better just because "urr durr hardware". Android is made to be compatible with thousands of devices. iOS has an incredible performance management just because they can tweak every bit of the actual OS down to the phone. This is why 2gb iPhone 6s will probably outperform any flagship on the market right now. They work in different ways. You should read these : http : // quora.com/Why-is-Android-so-slow-when-compared-to-​iOS It's as simple as that : Code management. Finally, don't forget that the Galaxy S6 Edge is more expensive than the iPhone 6, which lost Samsung about $400 millions last quarter. Flagships are all around the price of the iPhone 6 nowadays, and people need to understand this and quit bashing for old reasons. Just be more open minded, I know it's a great effort but I believe in you, you can do it. LoL. this one is heavily brainwashed. "However with that kind of hardware they still compete and outperform a lot of others in the smartphone battle, against 4gb ram they still win" Are you kidding me? You know you're spreading a blatant lie here. iOS multitasking is a joke compared to Android's. Let's try to open multi pages in web browser and see if all pages are still active, and then come here again. Yes, iOS seems to feel smooth that because it has much less features than Android does. But as long as you ifan are willing to adhere to the "pay more to get less" policy from Apple, it won't be the first world problem. LoL. Comparing the S6 edge price to the iPhone 6's is the most ignorant story I've ever heard. Ask yourself if iPhone 6 can even stacks up against the edge in the first place? Give me one internal part of the iPhone 6 that is better than the edge's? Now I get it, you blind fanboy don't take any consideration before jumping to conclusion, and I hope this may not apply to all Apple fanboys around the world. Geez! it's their choice. Who are you to judge people what they buy? Better mind ya own business heh? Maybe I should ask, Isn't it enough for you to insult Sony and Japan? Now I can see you got another job trolling Apple. I was wrong to think Koreans are friendly and helpful. You're a disgrace to your country. P.S: A Galaxy S6 owner. I didn't bash or troll anything. Everyone are free to give opinion regardless of if it's an admiration or criticism, and me is no exception. This is my perspective based on the article about Apple Force Touch. I don't think it's useful and I suddenly become a troll? What a stupid logic. And you do know who committed war crime right? No need more reasons why we hate them! Sony didnt commit war crime but you still hate them. Why? He's just a brainless Samsung zombie troll. Ignore him. lol dont try to start a flame war then. Some of us Android users enjoy apple products as well. We are not all "bashers"
Hey idiot! Why dont you take hallyu with you and go deep underground ok?